Sewing for me will have to wait until tomorrow when the in-laws head back to the airport. I did sew three midget blocks on the trip, but those will wait for Tiny Tuesdays. It is the last day of the month, I'll look to see what the new color is going to be, but feel free to tie up your pink odds and ends while you can. This is Midget Block number 89. It is called Cowboy Star. It is hand pieced with 24 pieces. 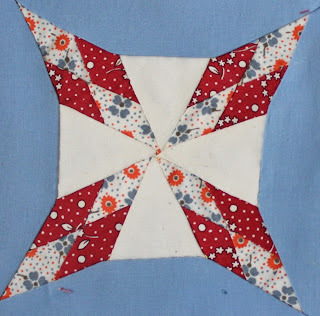 I am getting better at hand piecing, but it still lacks the nice tight seams that a sewing machine offers. 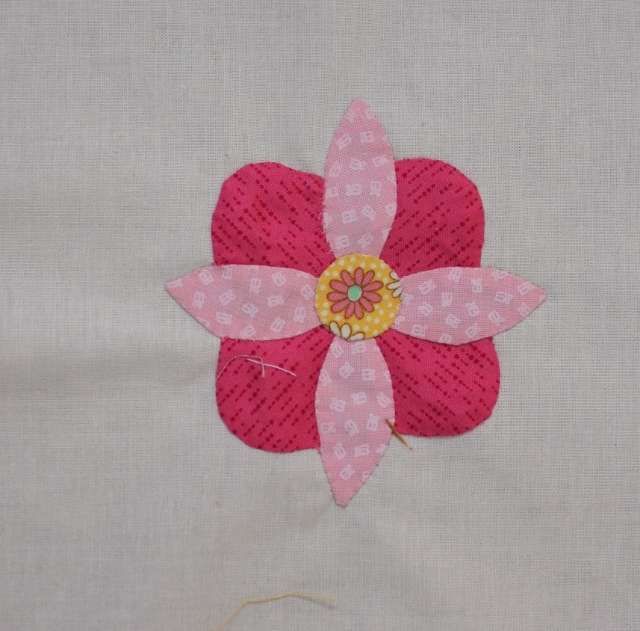 It does make matching up points easier though, and with all of those inset seams it is just as easy to do by hand. I'm not sure how much time I'll have to sew this weekend. Kurt is headed off to pick up his parents at the airport around lunch time. So far I've spent my morning putting things away which is the opposite of what I would need to do to accomplish something. I've even stuffed all the pink scraps back into their jar, though I haven't found the lid yet, so some may jump out again if there is time. The laundry room is still pristine, the study is starting to look functional, sometimes I wonder why the house can't be this way all the time. Use the linky below to share your own creations and projects so that I might live vicariously through all the people not getting ready for company and vacations. Anna and Ryan both competed at the next level of science fair yesterday. Today we got notified that they had both won prizes. We are just back from celebratory ice cream following the awards ceremony. Anna won third place in 6th grade biological for her project on the effect of UV radiation on e. coli growth. Ryan earned a 1st place ribbon in 5th grade environmental for his project on the effect of rising ocean temperature due to global warming on the rate of photosynthesis of elodea. I've got a stack of school work to try to finish tonight so that I leave with out guilt for spring break. In just a few short days I'll be on the sunny beaches of Mexico with a margarita and good book. I usually save major before and after projects for summer vacation. Sometimes though, things get out of control in the midst of it all. The laundry room is everyone's favorite dumping ground. With the in-laws coming to stay for spring break, several things needed some immediate attention. Today's mini makeover was the laundry room. Up next, the study! Wish me luck. This is another of the Extra Midget Applique Blocks. I think the official name is Flower #8. Obviously I can't keep that name. 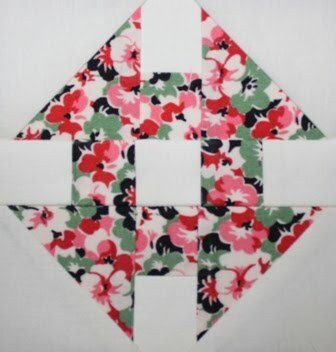 It looks like the Alstroemeria that was in my wedding bouquet, so I think that will be my new name for this block. 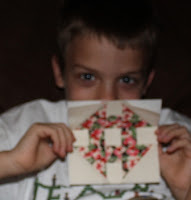 I used this tutorial from Fabric Therapy to prep the pieces using glue stick applique. While it wasn't entirely successful, I learned a lot and I think it will work better for next time. Though I had a chance to work on some pink scraps today, my sewing space is still overwhelmed with green scraps from last month. 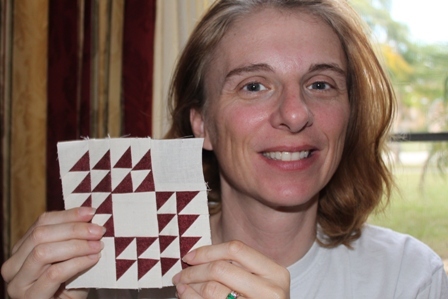 I have enough blocks to make a quilt, but just haven't quite gotten there yet. I did grab a few though, to make a place-mat to coordinate with January's red version. I finally found a few minutes to sew today. I wouldn't call it quality sewing time. It was one of those, sew a little, start the laundry, cut a little, watch the kids swim sort of days. 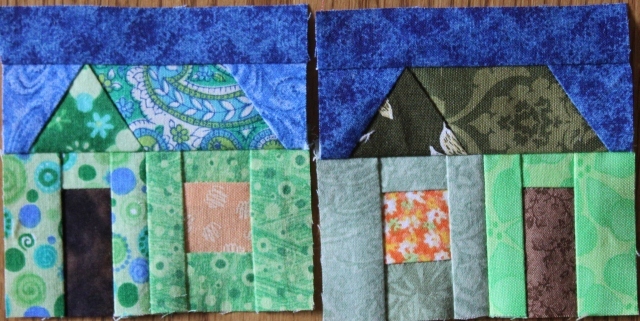 At the end of it all though, I have a cute little batch of nine patches from one inch strips. I'll mix these pinks with the reds and greens from earlier, and at the end of the year it will turn into something I'm sure. A crazy part of me thinks they would be adorable alternated with some cute hourglass blocks, but the reasonable part might win with a simpler setting. Time will tell. Happy Saturday!! Just one more week until spring break for us, so this will be my last chance to sew for a bit. The in-laws are coming to visit,which means cleaning up the sewing room. Today though is the start of a lazy weekend at home. I think Girl Scouts and a birthday party are all that we have scheduled. It seems like my posts jump from Tiny Tuesday straight to Scraphappy Saturday these days with not much sewing time between. I did get out my midgets last night though and do a little hand sewing. Kurt was out of town, leaving me free to do as I wished, but I was wiped out and didn't feel like leaving the couch. It is always nice when time and energy are both there at the same time. I just wish is happened more often. How about y'all? 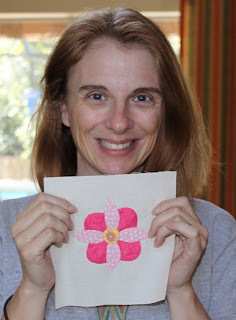 Anyone with time, energy and motivation to work on pink scraps today? 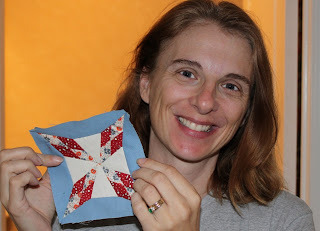 Use the linky below to share your scrappy creations and works in progress. This Midget Block is called French 4s. It is paper pieced in 3 sections with 17 pieces. 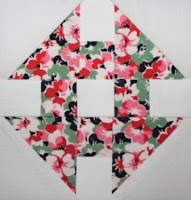 I think it looks like a Monkey Wrench block, which should be easy enough to sew traditionally, but the sizes would probably be odd for a block of this size. It was super simple and straight forward. I love the fabric for this one. Ryan was kind enough to hold it for a picture, though he was trying to hide behind it, because that seems like fun for 10 year old boys I guess. I'm not sure why I thought I could do camporee, a quilt show, pink scrap sewing and all the usual weekend work done all during the same day. Yesterday was a beautiful day for Camporee, a tiny bit hot and sticky, but sunny and gorgeous. I tried to talk Sydney in to letting me leave as her troop had plenty of adult supervision, but she really wanted me with her all day. I got her home and took time to shower and have dinner before heading back for the night shift with Anna's troop. Things started off well enough, we did the campfire and DJ followed by inflatable fun. Trying to settle the girls down to sleep was a bit difficult, but we finally got them to quiet down around midnight. It was 1 a.m. when the rain started. Shouldn't have been a big deal, but I was in a very leaky tent and spent most of the night trying to dodge falling drops and move my sleeping bag out of puddles. By dawn I was sitting up on a pile of damp sleeping bag soaked to the bone without a stitch of dry clothing to be found. I grabbed Anna and abandoned all hope, heading for home. I feel really bad about abandoning the rest of the troop, but I did head back later to find them all gone as well. The campsite was a submerged mess of partially collapsed tents and abandoned camping gear. We grabbed what we could and another family from the troop was nice enough to pack all the tents up and deliver them after the rain had died down. We've all been a bit wiped out since then, catching up on laundry and taking turns napping. Not exactly the productive weekend I had hoped for, but tomorrow is another day. My ScrapHappy Saturday will have to happen on Sunday this week. I have a basket of pink scraps patiently waiting, though it seems to have been invaded with a few other colors from my little house building escapade last weekend. I thought about getting a head start yesterday, but ended up driving in around all evening shuffling kids here and there before going to see my schools spring musical. Today is Girl Scout Camporee and it will be nice not to be in charge of anything for a change. Sydney's troop is only going for the day and she will probably want me to stay with her, though I hope I can sneak out long enough to go to the quilt show that the local guild has every other year. I keep wanting to get more involved with quilters around here, but time never seems to be open for it right now. This evening I am signed up to sleep over with Anna's troop, they were supposed to camp last night as well but a huge rainstorm had them all scattering for home in the evening hours. Right now I need to get everyone packed and loaded and start another round of driving in circles. So, hopefully tomorrow will find some time for sewing. How about you? Any pink masterpieces in the works? Use the linky below to post your progress, don't forget to check out the other links to see what everyone else is up to so far. This is Midget Block 53. It is called Winged Square and it is paper pieced in 8 separate sections for a total of 51 itsy bitsy little pieces. The hardest part of this block was trying to get all the little triangles facing in the right directions. 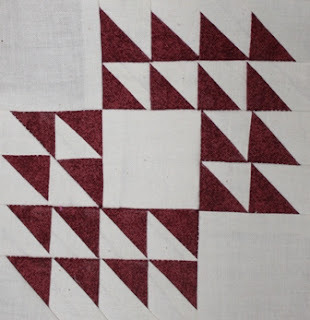 The pattern doesn't tell you how the pieces go together, and though I knew it had to work, it took me a while before I puzzled it all together. I wasn't planning on working on green string blocks this weekend. I was planning on doing some cleaning and organizing with a goal of emptying out the mixed crumb/string drawer. I have decorative jars where I keep my crumbs and strings sorted by color now and thought it would be nice to move out the ones that don't fit in my color sorted scheme. If you had asked me, I would have remembered that there were some green blocks leftover from March of last year. I used some of them in combination with purple blocks to make Lilac Potpourri, which I absolutely love. So anyway, it is too late to make a long story short, but there was a big stack of partial green blocks hanging out in the drawer I was trying to empty. A few short hours later, up went the blocks on to my design wall, waiting for a decision on sashing colors. Putting crumb blocks together with nothing in between is to difficult from a mashing of seams point of view, so lattice and cornerstones win the day. I thought brown, but that might be too dark. Several greens didn't seem to stand out at all, beige is the obvious choice, but I'm tired of beige. So how about yellow? Bright, happy, contrasty enough. There are people in the world that paint the town red. Around here, I make the houses pink. We have been invaded by many children for sleepovers. So far each of my three has at least one friend over for the night. There might be more on the way. Not a lot of sleep is likely to happen around here tonight. My school is sending out winning lottery letters. So far two of Anna's good friends have gotten in. Another girl from her Girl Scout troop was already in on the sibling preference, so it looks like she will know quite a few people next year. I'm just happy to finally be able to offer something in exchange for all the carpool and child delivery assistance I've taken advantage of in the last year. I wasn't feeling quite ready to be done with green yet. It has been a busy month and I have had to skip a few Saturdays here and there. So today I started by finishing up a couple of green houses that have been hanging out on the ironing board for a while now. After that I added a few more geese to the pile before pulling out the pink and officially switching gears. The garage sale is done, and the funeral finished, so other than a few test grades to total I am free to relax for a while. I think pink houses are calling my name. We have 7 random kids playing x-box right now, but as soon as they are all played out I'll be back at it again. Welcome to a new month of pink scrapiness!! Around here, spring has definitely sprung. I still have a few green odds and ends to clean up, but I am looking forward to diving in to this pile of pink some time today. There is a Girl Scout garage sale this morning and a funeral this afternoon, but I think the evening will be perfect for a little quite time in the sewing room. How about you? Lots of pink ideas floating around in your heads? There are a few ideas on the RSC12 tab at the top if you are having trouble getting started. Use the linky below to share your ideas or works in progress.